One of the fun things to do around Buenos Aires is try to understand what some of the street signs here mean. Because what is obvious to the porteños, is not so obvious to the students studying here. A few we’ve managed to understand: “leave seats for people with disabilities” or “unload and load quickly.” But there are some, such as the one below, whose meanings are completely lost on me. I pass this one all the time in the city, sometimes it’s a woman dancing with her briefcase, sometimes it’s a man, and all I can imagine is that this sign is used to signal places where one must stop and have a dance party. As my friend and I tend to do, we headed downtown one fine weekend to enjoy the Mexico cultural festival. I was excited to get my hands on a good burrito and I knew the shows on the stage would be excellent. When we got closer to the street we were excited to see the familiar red, white and green on the flags, but as we drew even closer we became increasingly confused. The flags had the correct colors, but the wrong designs. The folks were not dressed in the gorgeous dresses with billowing skirts that I had come to associate with Mexican traditional wear but in green, red and white outfits with shoes that laced to the knee. Highly confused we wandered the street looking at the signs trying to figure out what had happened to the Mexican cultural festival when we found a sign proclaiming this to be the Basque cultural festival. 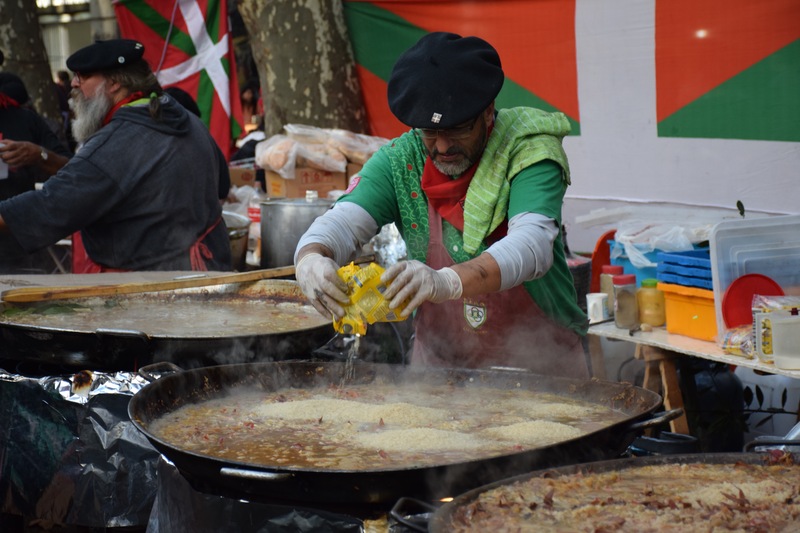 We happily went along with the change and learned about Basque culture and ate some excellent food. My friend had a stir fry type dish with squid, I ate a much less exciting meal of chorizo-type meat with onions on toast. Eventually, we googled the Mexican festival and found that it had happened the day before, so, sadly, I missed my burritos. On the other hand, Buenos Aires’ Facebook page is currently proclaiming that the Mexican cultural festival will happen tomorrow (although their website says Paraguay is scheduled for tomorrow) so those burritos may yet happen! The best choripan in the city is near Costanera del Sur, the ecological reserve on the edge of the city in Puerto Madero. To get there, you have to cross this little channel which always offers a great view of the Woman’s Bridge and a stop at our favorite exercise parks. On this charming afternoon we were walking back to the subte, enjoying the riverfront when we noticed a gondola in the river. The Italians brought over their best ice cream and pizzerias when they immigrated to Argentina, but they didn’t bring any gondolas so this one looked a little out of place. Upon closer inspection, we noticed that a second boat was driving in circles around the gondola, filming it. As we walked, we acted super nonchalant, because we might be famous in the future. 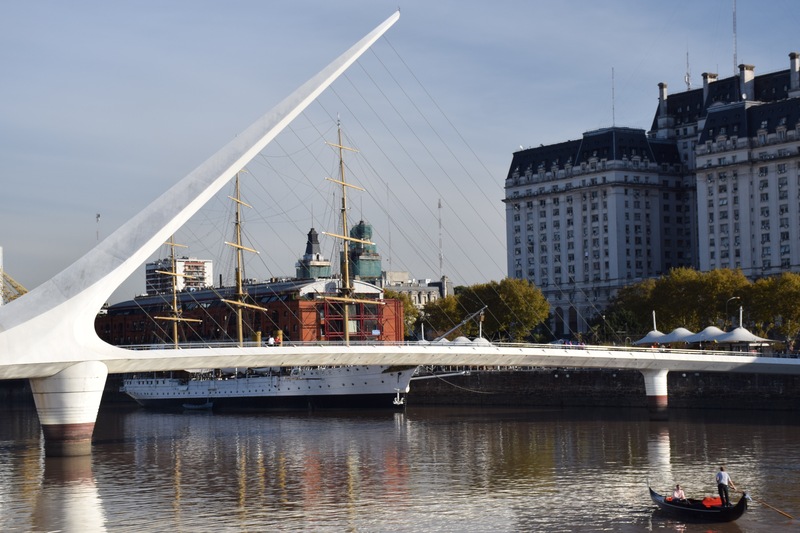 I googled around and I have no idea which films are currently shooting in Buenos Aires, but if you ever watch a film with a gondola and a big white bridge in the background, see if you can see me walking beside the river. This could be my big break guys. And of course, we did stop at the exercise area. We hadn’t tried out the bikes yet so we sat on the park bench and I slouched a little so my feet would reach the pedals. Then we happily, and very, very easily pedaled for a good five minutes, enjoying our view. The bikes were far too easy, they need to create a way for people to add or take away resistance because those bikes had none. The bench next to us also had pedals but these were at stomach height so you could sit and push them with your arms. Every Friday API arranges a nice cultural excursion for us to show us around the city. 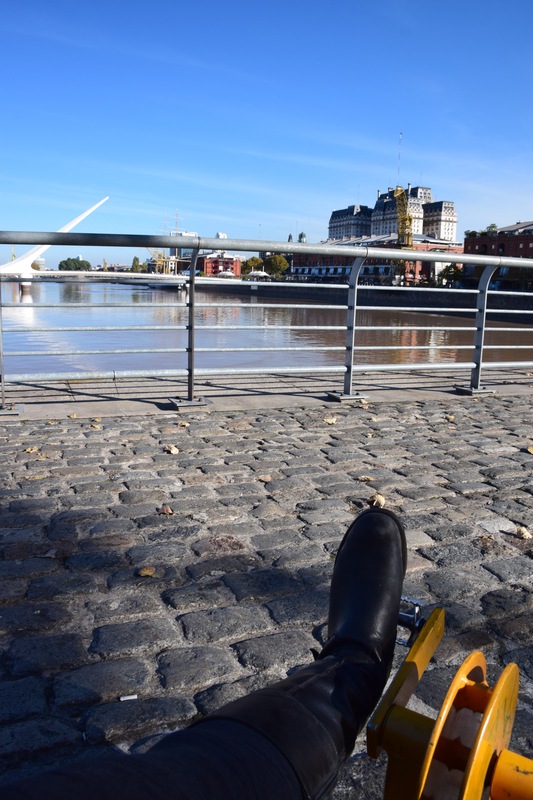 Last Friday, we headed down to La Boca. We had already seen Caminito once at the beginning of our trip but we returned last week for a more in-depth tour that included a museum in La Boca and the surrounding area, not just Caminito. Quinquela was a famous painter in La Boca who used to paint this very view from the his apartment (situated right behind me in this picture) so it’s a rather famous part of La Boca. In addition, for the environmentalists, this is an interesting river because it’s so polluted that nothing can live there (except for some very hardy turtles). They are trying to clean it up (and have succeeded somewhat) but it’s made difficult by the amount of toxins trapped in the soil at the bottom. They don’t want to turn up the soil too much for fear of harming to folks who live around here. In the past, when La Boca was more polluted, one woman living nearby got lung cancer from the pollution, she was really the one to first draw the government’s eye to the need to clean this place up. La Boca’s other claim to fame (the first being the tango) is its soccer stadium which houses the local La Boca team; and if you aren’t a fan of La Boca, it’s because you’re a fan of River. Like in most of Argentina, soccer is taken very seriously in Buenos Aires; but the rivalry between Boca and River is practically personal for many fans. The Boca museum is a tribute to the team holding past sports jerseys, pictures of all the players, and an interesting timeline that used three televisions per date to show what was going on in the world, in Argentina, and in that year’s world cup for each date on the timeline. 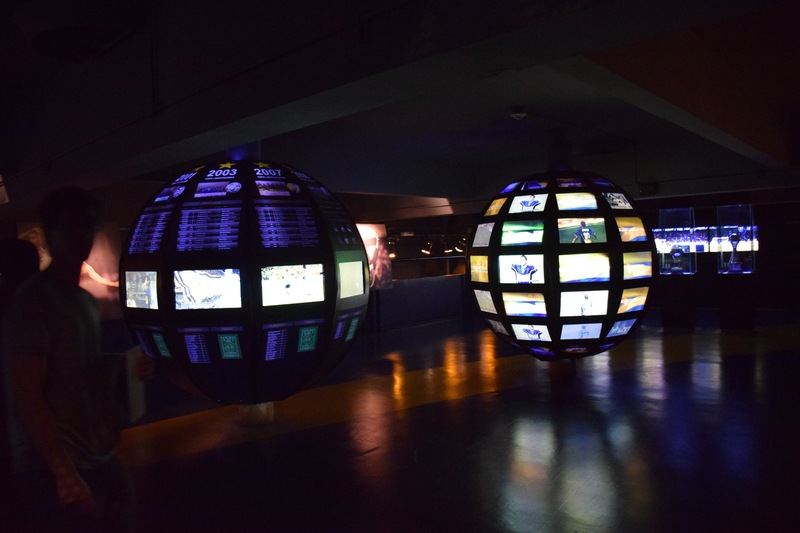 In addition, they had these two giant balls loaded with screens, showing moments from the team’s past on one; and on the other; and each of La Boca’s team rosters, game history for that year, and a television dedicated to that year. I’m a fan of soccer, but even I’m not THIS dedicated. And finally, the theatrical gem of Buenos Aires is Teatro Colon. This giant six story theater is famous throughout the world and Argentina, I was told it’s second or third in the world after opera houses in Austria and France (maybe?). Going to the theater is quite the affair and although it’s not required to dress up, the majority of people do still dress to the nines when in attendance. My friends and I were no exception and we took the very cheap opportunity of going to hear the Buenos Aires Philharmonic Orchestra the other week in some sky high seats. That doesn’t really matter since the point is to listen. 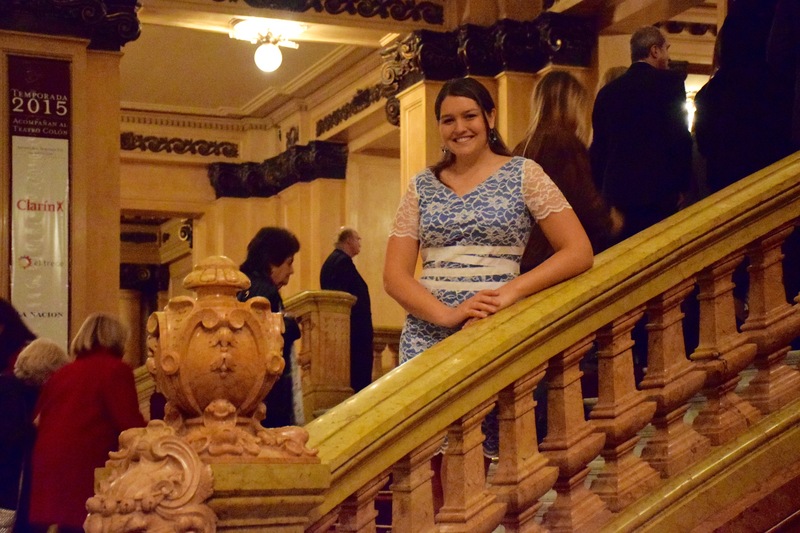 Luckily, I had the pretty dress Pier and I made to wear so I pulled it out of my closet and headed to the theater. We were at the very top of the theater so this sort of gives you a look at how tall the theater is and how it’s constructed. They built it straight up, so you never really end up being too far from the stage horizontally. The place has excellent acoustics, in some ways, the acoustics are too good. When the music hit a soft spot, or they played very, very quietly; someone always seemed to cough and the entire theater heard it. When I return in a couple of weeks for Swan Lake my seats will be all the way down at the bottom front and center. The dogs in La Boca are all quite stylish, most of them were sporting uniforms, which seemed pretty normal to me. What seemed much more abnormal were all the dogs that were sporting uniforms and bell-bottom jeans such as this one. Some of them even had skinnies on! If that doesn’t make your day a little bit better, than I don’t know what will, because these dogs all looked so ridiculous. #datcitylyfe: So my knee and ankle started bothering me about a year ago. Being in Southern California, there wasn’t much I could do so I waited until I returned North, at which point I began trying to get an MRI for my knee and find out what was wrong. After I went through the process of seeing my general doctor for a recommendation to see the specialist, specialist recommendation for the MRI and then MRI, the only date they had for the MRI was two days before I left for Israel, in which case I’d never get to see the specialist to interpret the MRI. Try number two came when I returned from Israel. This time I got the MRI done and interpreted before I left, but my ankle MRI was delayed because of issues with the insurance so I headed out to Argentina, with no idea what was up with my ankle, and my doctor telling me he had no idea what was going on the my knee as the MRI seemed good. After spending a lot of time walking around Buenos Aires and playing volleyball three times a week my ankle began to hurt quite a bit more. Knowing how long the process of getting it checked took in the states I was skeptical of restarting that process here in Argentina. My program advisors told me the doctors would be able to see me very quickly and there was no reason not to go if my ankle was hurting me. So I went, and this long process that seemed to take at least 1.5 months in the US took about 1.5 weeks in Argentina. The doctor told me my ankle was incredibly inflamed (including the bone which is apparently called osteomyelitis) and prescribed me medicine, new orthotics (because apparently the ones I got in the US were no good) and physical therapy. Now, I’m doing it once more for my knee (because my first doctor forgot to prescribe the MRI for that). Because of my travel plans it’ll take a little longer this time but I’ve already done the MRI and everything so now I just have to see the doc. Before the MRI he told me that my patella wasn’t quite lining up with my femur and that was probably the problem, in which case he’ll prescribe me some more physical therapy to get the muscles readjusted and working correctly once more. All in all, the Argentine system has been far cheaper and much faster than what I had going on in the states. The most challenging part of this experience has certainly been trying to do all of it in Spanish. I spent ten minutes trying to explain my medical history to my first doctor when my program advisor (who was there as a translator) told me he spoke english so I could switch if I wanted. Both MRIs had to be done completely in Spanish and my second doctor (there orthopedic specialist) only spoke a little English so I only spoke to him in Spanish. Luckily, by the time I’d seen him, I’d picked up quite a bit of medical terminology so the whole visit went very smoothly. The only point on which I double checked with him and my advisor was when he said my bone was inflamed, because I really couldn’t believe that was possible.